Oranges are high in antioxidants, which neutralize the effect of free radicals (unstable oxygen molecules in the body believed to cause aging).Oranges also have more fiber content than most fruits and vegetables. The origin of the citrus fruit can be traced to Asia twenty million years ago. Christopher Columbus brought the first orange seed to the New World on his second voyage in 1493. 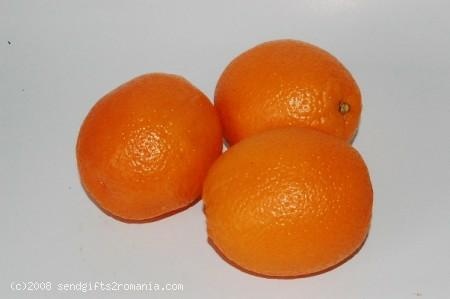 Did you know that Brazil is the largest producer of oranges in the world? Send Gifts to Romania gift delivery policy: every gift delivery is handled with extreme care. All the fruits in our online gift store are fresh and ripe. All the gift deliveries to Romania are 100% quality guaranteed. Send a gift of fresh health to Romania!